Download Your Free Internet Marketing Product Database Worth $67.00 Now! Store all of your important Internet marketing product details in one easy to use file manager! 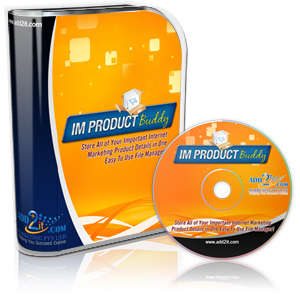 To download your free copy of IM Product Buddy, please click here! This entry was written by Frank Bauer and posted on May 31, 2009 at 6:55 pm and filed under Business Organization Tools, Desktop Software. Bookmark the permalink. Follow any comments here with the RSS feed for this post. Hey, just wanna let you know your RSS feed is getting WC3 errors for me. Please find a solution! I checked it right now and the Feedburner RSS feeds seem to work fine for myself. Does anybody else have the same problem? We take the privacy and security of your information quite seriously. We are a merchant many years in flawless standing with PayPal. We provide top-notch live 24 hour customer care to protect that status, and more importantly, to protect the trust you, our customer, have placed in us.